NEW CD : JEAN-CHRISTIAN MICHEL PLAYS JAZZ - NEW VIDEOS - NEW SCORES AND NEW SONG BOOK - A SPECIAL PAGE ON THE CLARINET - NEW DVD OF JEAN-CHRISTIAN MICHEL - PLEASE CHECK OUT THE LATEST NEWS ! Among all of Jean-Christian MICHEL's friends very few remember the moving birth of his vocation. Only a few close companions remember the solitary boy who went to the organ to join his friend "the old blind man", while they played ball in the wasteground. Jean-Christian MICHEL confesses with difficulty his memories of childhood: "He made me resound with chords which dazzled me... I saw his eyes, sometimes wet with tears, his forehead raised towards a world which still escaped me. He spoke to me throughout his playing, and his notes have stayed with me as flowing pearls on the wrinkles of his face". entered into him and from then on multiplied every day. 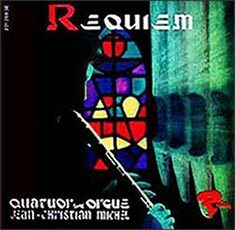 Jean-Christian MICHEL felt the need for a way out, a clear warm sound which would deliver him from the magnificent chaos of the organ. It is for this reason that he has dedicated himself to the clarinet. That is why this amazing shiver which bids farewell to the man with the empty eyes was born.